With many sectors of the food industry already taking steps to reduce acrylamide levels, FDA issued final guidance in March for growers, manufacturers and foodservice operators on reducing acrylamide in certain foods. Acrylamide formation occurs primarily in plant-based foods, notably potato products such as French fries and potato chips; cereal- and grain-based foods such as cookies, crackers, breakfast cereals and toasted bread; and coffee. As non-binding guidance, FDA recommends companies be aware of the levels of acrylamide in the foods they produce and intends only to suggest possible approaches to reducing acrylamide levels, not to identify specific approaches. Additionally, the guidance does not identify any specific maximum recommended level or action level for acrylamide. That said, FDA will be monitoring acrylamide levels in food to determine if reductions are occurring. Thus, one possibility is that if no voluntary reductions are seen over time, the guidance may be replaced with mandatory regulation – if not of FDA’s own volition, then due to pressure from consumers, media and social media. The guidance includes the following suggestions for the foods most at risk for acrylamide. Because some of the options may reduce quality or have other impacts on the final product, you will want to assess these and other options as best relevant to your product. David Acheson, M.D. is the Founder and CEO of the Acheson Group (achesongroup.com), a consulting firm for food and beverage companies with a focus on strategic risk management. He was was associate commissioner for foods in the FDA. Raw materials used in potato-based foods: Select potato varieties that are low in acrylamide precursors, keeping in mind seasonal variation; optimize potato maturity by controlling planting time, harvest time, and input management, and by removing immature tubers before processing. Avoid bruising, sort out or carefully trim potatoes with defects. Avoid cold temperatures during harvest, transport, delivery, and storage. Manage storage conditions to control sprouting and provide ventilation. Monitor reconditioning results and avoid reconditioning potatoes stored for prolonged periods. Assess reducing sugar levels in incoming potatoes, identifying target levels or using treatments to reduce sugar levels. Processing French fries: Cut fries in shapes with lower surface area to volume ratio and screen out small fragments. Change blanching practices. Use sugar dips to reduce variability (except in dips where reducing sugars may increase acrylamide). Use alternative coloration methods to discourage overbaking. Use sodium acid pyrophosphate, evaluating other dip or batter ingredients to determine if they contribute to acrylamide formation during frying. Preparation and cooking instructions on packaged frozen French fries: Provide appropriate cooking instructions (examples include: "cook to a light golden color."). Avoid browning fries. Avoid overcooking or undercooking. Avoid cooking in a toaster oven to prevent overcooking. Reduce cooking time when cooking small amounts. Packaged frozen French fries and foodservice operations: Provide appropriate cooking instructions. Educate foodservice workers to follow proper frying techniques. Select potato varieties that are low in reducing sugars for frying or roasting. Properly handle and store potatoes. Bake and toast breads and other baked goods only to a light brown, not a dark brown. Avoid overly dry or crusty products in cereal-based foods. Processing sliced potato chips: Remove peel; wash or soak chips before frying; cut thinner slices. Decrease frying temperatures to 347°F or below. Target higher moisture endpoints. Use lower temperatures during final cooking stages. Use techniques like flash frying, vacuum frying or batch frying. Sort by color as an indicator of acrylamide levels, especially if correlated with measured levels of acrylamide in specific products. Processing fabricated potato chips and other fabricated potato snacks: Select potato flakes with lower levels of reducing sugars. Treat flakes with acidulants, calcium or asparaginase during flake production. Partially substitute potato flakes with other ingredients. Add calcium salts, acidulants or asparaginase to potato doughs. Decrease cooking temperatures, using lower final temperatures in multistage processes and higher moisture endpoints in fabricated chips. Raw materials in cereal-based foods: Use wheat varieties that are lower in asparagine. Use wheat grown with adequate soil sulfate and without excessive nitrogen fertilization. Partially substitute low-asparagine cereal grains for higher ones. Ingredients and processing of cereal-based foods: Replace ammonium bicarbonate with alternative leavening agents, avoiding increases in sodium levels. Replace reducing sugars with non-reducing sugars, use reducing sugars with lower fructose content, only add sugar coatings to breakfast cereals after toasting steps. Use asparaginase treatment. Use calcium supplementation (calcium propionate may increase acrylamide levels). Use yeast fermentation, and change fermentation conditions. Lower thermal input through modifying baking times and temperatures. Consider alternative baking technologies. Monitor production by using color as an indicator of acrylamide. Set a higher moisture endpoint and monitor moisture levels in finished products. FDA intends to update the guidance as needed to reflect new developments in the field of acrylamide reduction. So what does all this mean? It is now almost 15 years since the concerns around acrylamide emerged. There has been discussion on a variety of fronts regarding whether or not there should be an action level for acrylamide. But, as noted above, FDA has avoided going down that road, instead the Agency has issued guidance. To me, this signals that FDA is serious about acrylamide, but not so concerned about it as a human health hazard that they feel obligated to set action levels and embark on a strategy to reduce acrylamide in foods through a regulatory approach. FDA and the food industry are already taking acrylamide issue seriously and looking for ways to reduce levels. So my interpretation of this guidance is to continue to encourage the food industry to explore acrylamide-reducing technology and to strive to continue to reduce levels over time. So don’t ignore this guidance, rather do your best to follow it. That way the risks will continue to be reduced over time in a much less prescriptive way – which is likely better for all in the long run. Are warnings for acrylamide in foods informative, premature or preempted? 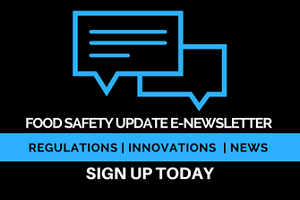 What Do the FDA's Preventive Controls Rules Mean to You? David Acheson and Melanie Neumann offer insight on complying with the new FSMA rules.